Another video preview surfaced of the next Nokia N8 PR2 firmware update that is supposed to bring split-screen and portrait QWERTY keyboards, as well as a new browser. It seems that things haven't moved much along from what we saw a few months ago, but now at least the split-screen QWERTY is shown, along with some of the new browser. This version is probably in testing mode already, so it should hit your Nokia N8 in the next few weeks/months. Not that there aren't custom firmware concoctions out there. At least we know that Nokia is determined to make good on its promise to keep updating Symbian incrementally, including with the new user interface, hints of which we saw recently. If this update is released before the E7, I'll purchase one. Depending on how much the price is of course. I love my N8 in it's current state, but improvements are always welcomed =) Long Live Symbian OS! what is the appeal of symbian? I just dont see it! Osiris: E7 has been in stores 2 weeks already, in Finland tho. 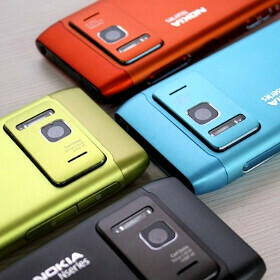 Im not a Nokia fan but N8 design is so beautiful. Colors are so strong, i mean orange phone whats not to like?
? NOKIA " where is continues auto focus in video recording" ? Hey thats not fair! What about s60v5 users? we what this update either. Earning money for E7, or may change my plan.